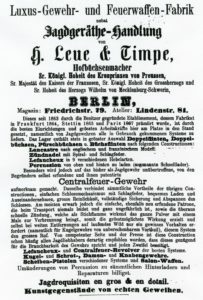 The Advertisement for H. Leue & Timpe from Vol. 1 of the Handbook of Industry. In 1873 Christoph Sandler, the Author of the “deutschen Handels-Addresbücher” published the “Handbuch der Leistungsfähigkeit der gesammten Industrie” or Handbook of Industry. It contains entries for many of the Waffen and Gewehre makers in business at that time and often gives the date a business was foundeded and who the founders were, their products and number of employees. It also contains advertisements for some of the entries. To view the transcriptions for Vol. 1 click on Handbook of Industry Vol. 1 or for Vol. 2 click on Handbook of Industry Vol. 2. Over the years that Dietrich Apel collected information on the many German Gun makers he also collected information on the Austrian makers. He wrote several articles about the Austrian makers for the GGCA Journal “Der Waffenschmied” and shortly before I took over this web site he shared with me a CD of a lot of the material he had collected. Click on Austrian Gunmakers to see this material and to see a list of and links to makers and material specific to them. The page Miscellaneous Advertisements for Austrian Makers contains single Advertisements found in old periodicals for relatively unknown makers. The Arms trade in Europe flourished in numerous City centers and Dietrich Apel wrote an excellent introduction to these. Click on German Gunmaking Centers to read these and for links to web sites with additional information on them. German Makers, Misc. or unknown is a collection of images of guns by makers of which I presently have no information about. Miscellaneous Advertisements for German Gun Makers contains single advertisements found in old periodicals for Gun Makers and Dealers who do not have a Archive page dedicated to them. History contains links to articles about the history of the City Suhl, two articles about German Guns and Gunmakers in America one in English and the other in German, a story explaining how so many German hunting guns came to the United States and a History of the German Gun Collectors Association.